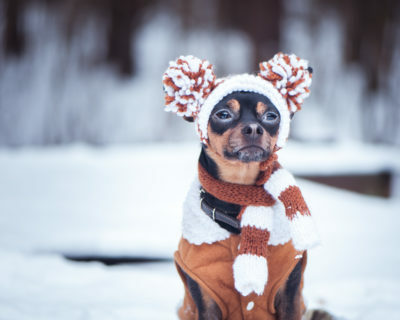 The coldest part of the year is finally upon us, and while humans that live in states or countries with cold winters have become used to the harsh conditions the same may not be true for your dog or cat! When old man winter rolls around it’s easy to reach in your closet and grab one of the many coats you’ve accumulated over the years, but what are some steps you can take for your pets? UNDERSTAND WHEN IT’S TOO COLD FOR YOUR PET. It goes without saying that not every dog is a Siberian Husky or a Saint Bernard. While you may think that your dog is fine going out for long periods when there is snow on the ground you may, in fact, be wrong. Every breed of dog is different just like every individual dog is different, so there is no hard and fast rule that I can give you about how to treat your dog in the cold. However, there is the handy Tufts Animal Care and Condition scale that gives us a pretty good idea! 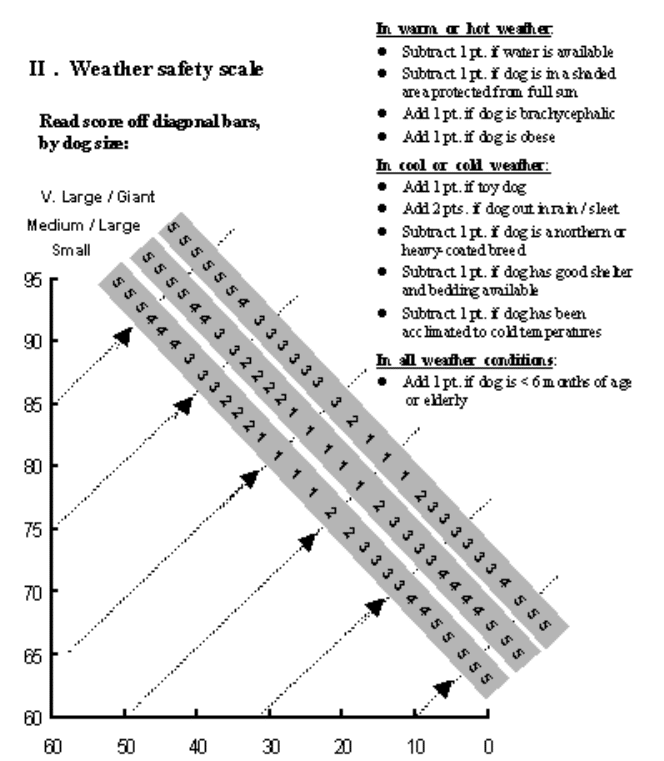 The scale gives us a good idea of when dogs should be brought out of the various elements. Now this isn’t to say that you can’t let your Chihuahua out in the snow to use the bathroom. It just means that you should bring them inside shortly after. If your dog is older or has a weaker immune system then it’s a good idea to err on the side of caution and bump them up on the scale. It’s a tad cliché at this point but the old adage of “If you’re cold, they’re cold” is usually the best rule of thumb to use. It’s hard to know what’s going on in your dog’s head sometimes. After all some of them eat out of the trash and will look at you perfectly content while they do so. Luckily though they tend to be a bit less obtuse when it comes to being cold. Signs like shivering and whining are solid indicators that your pooch is too cold. If your dog isn’t very vocal and almost never whines, then watch how they move around. If they slow down or are making an active effort to keep their paws off the snow, then they probably need to come inside. Those pads might be tough, but they can get frostbitten just like your digits can! It’s also important to note that just like your skin in winter dog’s skin and coat can get dry and itchy. We recommend our Triple Action Skin and Coat Soft Chews to help their coat and skin shine even in winter! Now that you know when your dog needs a leg up against jack frost, what can you actually do to give it to them? The easiest solution is to limit the amount of time that your dog or cat spends outside when it is particularly cold out. No coat and hat will help your dog stay out in -20-degree weather all day. Your dog may miss the outdoors for the day but if you keep them entertained inside it’s ultimately for their own good! If the situation is a little less dire and you want your dog to enjoy a slightly chilly day then the best course of action is to give your fur baby a coat or sweater. While some people don’t care for the look of clothes on dogs, in the winter it’s less a fashion trend and more a necessity. The fine hairs on some breeds like a Greyhound for instance, just can’t stand up to the blistering winds and cold that some environments provide. A well-fitting coat will help your thin haired dog stay warm and enjoy a romp in the snow! The same logic applies to all puppies, even puppies of larger breeds, since they are so small they just can’t generate the body heat of their older counterparts. Some people go the extra mile and put boots and hats for their dogs. While that is helpful when there is a lot of salt or de-icer about it can make your dog feel awkward and move less comfortably. I would recommend seeing how your dog does in them. Another option is to make sure your dogs have a heated area. Dog houses with heated floors might not be the best option if you don’t have a yard but it gives your dog an area to warm up their paws and stay out of the elements. The same is true if you have an outdoor cat or a barn cat. Make sure they have somewhere to go and warm up. Also, give your car a quick check in the morning to make sure no one crawled inside at night! When the mercury drops it can be all too easy to forget about our furry family members and their needs. Just keep in mind that just like you or I the cold and wind can get to your pooch or cat and pose a serious health concern. We know you love your pet, so show it to them by making sure they have a safe and happy winter!